The Priwa Plus 31kW is a highly reliable condensing, compact, wall mounted Combi gas boiler. 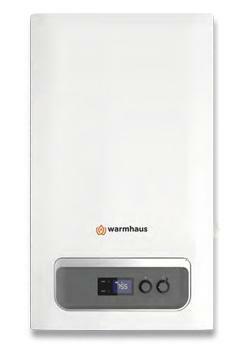 Designed and manufactured by Warmhaus, this is a highly efficient unit that comes with an efficiency rating of 90% and ErP A rating for heating and hot water. It also comes with a strong flow rate of 14.8 litres per minute. An output of 31kW makes this boiler suitable for larger homes with a high demand for heating and hot water. There are a couple of other outputs available in this range too: 35kW and 40kW. Warmhaus have designed this unit as a compact boiler, with a width of 288mm, it’s able to fit just about anywhere and can be installed in the kitchen or on a balcony. Despite being compact, the Priwa Plus has a lot of features such as an 8 litre expansion tank that can provide 130-140 litres of water to the system, a wide smart LCD display which shows the temperature of heating, hot water and the pressure inside the flame modes, an effective circulation pump with a frequency convertor, a high efficiency pump and a continuous flow of hot water to the heat exchanger. The Priwa Plus is quiet in operation thanks to the 10mm cover isolation. With the Priwa Plus being a Combi boiler, it’s the ideal choice for smaller properties as there’s no need for an external water tank or cylinder since everything is wrapped up in one cost effective unit. Available with a 2 year warranty, you’ll be given the peace of mind that you’re well covered.